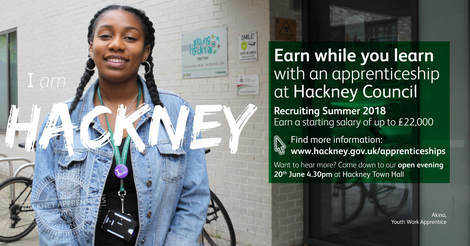 Hackney Council’s spring apprenticeship recruitment drive has begun! We are recruiting for apprentices in public health, procurement, housing and in the film office. All of the programmes last at least 12 months and combine work, training, and study towards a recognised qualification in a relevant subject. A commitment to undertake a qualification. Shoreditch Trust is a registered charity that works with local residents to help improve their health, wellbeing, social networks and opportunities. They are on the lookout for people who are interested in joining their team through a range of roles including permanent, part-time and volunteering opportunities. Hackney VCH is looking for a friendly individual to support people in the weight management and physical activity programmes in Hackney Leisure Centres, specifically supporting those that have limited English language skills entering the programme from Hackney’s Turkish population. G4S are recruiting for a range of roles including cleaners, caretakers and maintenance managers. To apply for a role please email your CV to: opportunities@hackney.gov.uk with ”G4S facilities managers and cleaners” in the subject line and state which role you are interested in. Deadline is 12 pm on Wednesday 27 February.